All posts related to science, including those involving combinations of science and religion and science and politics. First, of course, we should ask why anyone should embrace science*. I’m reminded of the quote, “The perfect is the enemy of the good.” Frequently people object to science on the basis that it isn’t perfect. A history of discovery of new things can also be portrayed as a history of error. Obviously, if you discover something a new, better theory, it means that something you believed before was wrong. The interesting thing, the critical thing, is that it is science that corrects the errors of previous science. So the reason I suggest for embracing science is this: It works. You are reading this on an electronic device that is the result of applying scientific theories. Those scientific theories replaced other, less robust theories, and thereby enabled the invention of new technology. Life expectancy is increasing because, however often medical science may be in error, it’s much better today than it has ever been before. I was interviewing my 98-year-old mother two years ago regarding her experiences as a nurse. She graduated from nursing school early in World War II. When we discussed vaccinations she got very emotional. “How could anyone want to go back to the time before these vaccinations were invented/discovered?” she asked. I tell this because we have people who think that science has made errors in the formation of vaccinations that have caused very negative side effects. I actually believe these ideas are wrong, and that vaccinations are safe, but even if there were problems, we would still be far ahead because of those vaccinations. People simply have no concept of what things were like before. But this also illustrates a simple issue with science. If a scientific theory is wrong, it is more scientific study that will demonstrate the problems and potentially point the way to better solutions. That’s how progress has been made over the years. Unfortunately when people perceive problems with the scientific consensus, even imaginary problems, they often decide that since science isn’t perfect, as far as they can tell, they might as well go for something else—anything else—that might promise a solution. These solutions are invariably more dangerous than the status quo. Unless, of course, they are generated and tested by valid scientific study. Science is not perfect, but it is the best means of finding better solutions than it has already found. If you don’t believe that, simply ask yourself if, arriving at an airport, you were given the opportunity to fly on an aircraft designed according to the consensus of the best aircraft design, or one designed by someone who rejected aeronautical science, and which had not been tested by methods standard in the industry. Even a test pilot would definitely want an explanation of why he should expect the second aircraft to fly. Yet we choose the second option in many cases regarding our health and also regarding public policy. Now I’m not proposing that we stick with consensus science despite the evidence. There’s a good way to challenge a scientific theory, and that is to gather good data and challenge it. Yes, scientists are people like the rest of us and may resist change to a cherished or simply comfortable position, but unlike theologians (sort of like me), they do have a history of moving en masse to a new position based on the evidence. As an aside, there is the great illustration of a philosopher (or metaphysician, etc, see this) who is like a blind man in a dark room looking for a black cat that isn’t there. The punch line? Under the same circumstances, the theologian will locate the cat. Science demands the actual cat, as it should. And that’s why we should embrace it. Science is good at studying actual black cats and determining when they aren’t there. But what does this have to do specifically with Christians embracing science? Well, I could again say, “It works!” That’s a good reason. If you want to live a long time, you should pay attention to science and its results. Speaking from the perspective of theology, though my field is biblical studies, we have the simple and repeated statements of scripture, such as Genesis 1:1-2:4a, Psalm 8: 3-4, Psalm 19:1-6, and Psalm 33:6-9. These form a foundation of much of scripture. The idea that God is the creator underlies pretty much all theology. How creation was accomplished is much more a subject of debate, though I actually think it is not something for theologians to debate based on the Bible (or other sacred texts) and religious tradition. Rather, how creation occurs is a scientific question and should be investigated as such. Why do I say this? One of the principles I try to teach regarding studying the Bible (or any text, for that matter) is that if you ask it questions it is not trying to address you will likely get skewed answers, if not totally false ones. How far your question is separated from the intention of the text is going to determine how far you are from understanding what the text conveys. Let’s take the Samuel-Kings books (2 of each), for example. There’s a rather simple historiography behind these books. If you obey God you will be blessed while if you rebel, you will fail. So the story of these kings, while it contains a variety of additional data, is focused generally on displaying this theme. Occasionally the history gets in the way of the theme, such as in 2 Kings 14:23-29, where Jeroboam II is described as one who did evil, yet the author must explain the upswing in Israel’s fortunes during his reign. Modern historians are very interested in precise chronology, but other than general lengths of reigns, the author lacks this perspective. Many efforts have been made to work out the chronology based on the numbers provided, but efforts have somewhat questionable results. The reason is simple. It’s not that the writer is careless in general; it’s that this isn’t his main concern. To get a bit further off track, let’s consider 1 Kings 7:23, in which the “bronze sea” is described as having a diameter of 10 cubits but a circumference of 30 cubits. This would result in a value for Π (pi) of 3.0. Now we all know it’s 3.1416. Well, not so much. I just punched it into Google and I got 3.14159. So far as I know, nobody has calculated an exact value for pi. You just round it somewhere that works. Lots of arguments have resulted from 1 Kings 7:23. How could God make such a mistake? Well, God didn’t. The author of Kings, collecting his data from various sources, used a very loose round figure. He had no intention of passing on the value of pi. For a Bible student, this is only a problem if you’re expecting the text to tell you things that the authors didn’t know and didn’t particularly intend to convey. There’s another lesson, however. The Bible isn’t a mathematics text. If you want to know the value of pi, you go where the knowledge is, and that’s the physical universe. I recall being instructed in math class to measure some circles with a flexible measuring tape and calculate the relationships. I didn’t get it right, but I got it close enough for the purpose. The value of pi is not a revelation needed in scripture; it’s there in the physical world. Theologians refer to this as “general revelation” as opposed to “special revelation,” such as what we get in scripture. Christians often tend to think of special revelation, the Bible, as somehow more reliable. But the fact is that we have many interpretive steps between the text and the resulting doctrine, and this difference has resulted in many different denominations and even different faiths. Yet I hear Christians complain about medical science not getting its act together and agreeing on the details of healthful living in all cases (though they’re very good, we want to demand perfect), while at the same time being totally comfortable with the massive variety of Christian doctrine, all claiming to be based in the same scripture. But special revelation, scripture, suggests that God breathed both it and also the physical world. The scientist studies God’s word as truly (or even more so) as does the theologian or biblical scholar. If we don’t believe that, we don’t really believe the scriptures. The real issue is not which is better but what each variety of revelation actually is intended to do. So, if you want the value of pi, please measure some circles, or just go to a math text. If you want to meditate on God’s activities in human lives, read scripture. And/or take the time to encounter some of God’s creations we call people. * I use “science” throughout as a general term for the study of the natural world with an intention to produce repeatable and objective results. Students at UC San Diego are trying to solve a really serious problem. No, Dr. Who, You Can’t Do That! So says (or at least that’s what I derive from) the work of Dr. Richard Muller. Enjoy! An article today on FiveThirtyEight says it’s possible that the simple awarding of badges to those who follow certain procedures (openness of data, revealing methodology, etc), may have sparked an increase in these good practices. Or not, of course. The correlation is pretty clear. The causation is somewhat less so. It could be that all the publicity regarding replication has been more conscientious scientists choose more rigorous and open approaches. What’s interesting to me is some of the popular fallout and commentary that I’ve heard on this. Completely unscientific quacks and nuts use the errors made by scientists as a cover for their own ridiculous claims, while ordinary people decide they can ignore scientific evidence because it might be wrong. If it might be wrong, why should I bother? Projects such as the one awarding badges for certain practices can help with the public perception as well as the actual practice of science, and that will be a good thing. What bothers me about the frequent response is that people who are actually much less careful and accountable than the scientific community use the misbehavior as some to both denigrate science as an enterprise and to open the door to completely untested ideas and theories. Even though the scientific community has its problems—and I strongly commend those organizations working for greater transparency—your odds are still better working with material produced by a community that at least aims for sound methodology. Sure, some science may be wrong, but I’m willing to bet my life on my doctor’s views over those of someone who guesses and goes by their feelings. I’ve been fascinated by Pluto since I found out it existed way, way back in prehistoric times. So here it is. I’m looking forward to closer images after the flyby. Hanz Gutierrez has reviewed Creation in Scripture by Herold Weiss on the Spectrum Magazine web site. Spectrum is published by the Association of Adventist Forums. Many may not realize that Dr. Weiss is Seventh-day Adventist, though he clearly differs with the officially proclaimed church view on creation. He describes his journey in another book, Finding My Way in Christianity. I commend Creation in Scripture (note that I’m the publisher, so that’s likely!) because it looks at multiple views of creation in scripture. Each of these viewpoints can help us understand something about God the creator. Would I Publish a Creationist Book? Herold Weiss is a biblical scholar and is talking about creation and creationism from the biblical and theological point of view. It was his book Creation in Scripture that got the book set started. “For creationism I have no use.” I publish that. I’m also a known advocate of excluding creationism from the public school classroom. I’m a board member of Florida Citizens for Science. So we know where I stand on the issue. I’m a theistic evolutionist, though I don’t like that term. So would I publish a creationist book? I’m often asked this question by people who wonder just how far to the liberal side of the spectrum I’ll go in terms of publishing. In this case, considering how strongly I’m identified with one side of the issue, we have the opposite question. We judge manuscripts, not authors. I have been asked about things an author said on his web site and whether they “fit.” That’s not my concern. There are many issues of definition in even that short doctrinal statement. For example, amongst our authors we have quite a number of definitions of what the word “inspired” means with relation to scripture. Having said that, if a book falls within that statement, we’ll consider it. Does creationism fall within those parameters? Absolutely. So the longer answer is again, yes. But remember that this openness to publish covers a large number of other issues as well. 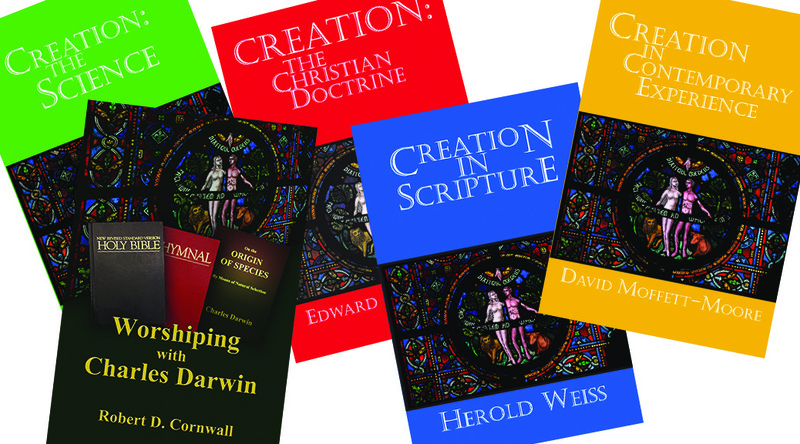 Why are all our books on creation written by those who accept theistic evolution? Again, a simple answer. Those are the ones that were submitted and accepted. Aha! A snag! What our hypothetical questioner would probably like to know is whether this manuscript, the one he or she has in hand, expending from days to decades, would be considered for publication and what its chances would be. Would the fact that I have a firm position on the issue prejudice me against that manuscript? Without doubt my beliefs influence what I do. But one of my beliefs is that the best thing to do with theological disagreements is to discuss them, entering into genuine dialogue. I consider creationism to be a very live theological debate and one on which we should be having dialogue in the church. I think actual dialogue on this subject is rather rare, but I’m ready to promote it. In fact, I see myself as a publisher in the role of an advocate for advocacy. So if I publish a book on creationism I will also put every effort into marketing it. That doesn’t mean that I will bend over backwards to accept the first manuscript on the topic that I get. I have been studying this subject since I first learned to read, and so I have a very good feel for the literature. Let me provide an example. Dr. Kurt Wise, who earned his PhD under Stephen Jay Gould at Harvard, is a creationist. He wrote the book Faith, Form, and Time. The link provided is to my review. It’s a good book. I disagree with practically every word in it. I don’t see those two statements as contradictory. I consider it the best statement of a Christian creationism as is available for a popular audience. Wise starts from the premise that Genesis teaches a young earth and a literal creation week, so we must follow from that point and discover the science that proves God right. I disagree with that premise. If you can send me a manuscript that is as good as that one (good luck!) I’m bound to publish it. And there are lots of other manuscripts that would be good. For example, looked at from the point of systematic theology, how does a young earth or a literal creation week (or both) fit into a doctrinal pattern? What other pillars of the faith lean on those concepts? One could write some excellent systematic theology in that area, and consequently argue with our existing volume, Creation: The Christian Doctrine, which argues that those are not important. It happens I agree with the latter book, but that won’t prevent me publishing a rebuttal! Now if I had a category for science, which I don’t, I would require that material in it be reviewed by qualified scientists. That would be another matter. I don’t think modern creationism has yet earned a place at the scientific table, and I’m not the one to offer that place. It must be offered by scientists who are active in their disciplines. I’d have a team of them as readers if I were a science publisher. But the biblical, religious, and theological debate is very relevant and active. For those who are interested, I didn’t become convinced that the earth wasn’t young or that the creation week wasn’t literal by studying biology. In fact, I never took a college course in biology. I’m not going to judge one’s biological pretensions. Well, unless they violate elementary principles, that is. It was through study of the scriptural material that I became convinced it was not possible that God was intended to provide either the “how” of creation or the timeline of earth’s history. There’s a great deal of open territory for studying biblical studies and theology involved in that! I can’t help but finish with some pictures that illustrate how thoroughly indoctrinated a creationist I was. 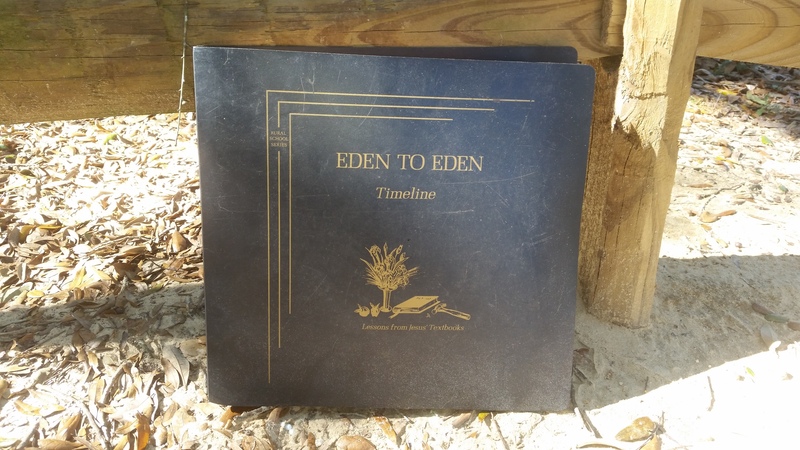 These are pictures of the “Eden to Eden Timeline.” You can see in the second image that we were taught that the date of creation was 3957 BC, a correction of the more common 4004 BC. 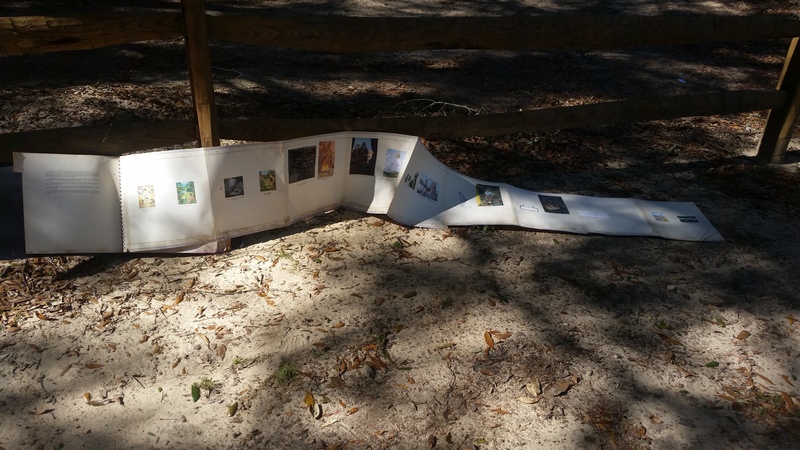 Students added pictures and colored maps as we worked our way through the Bible, entirely guided by this timeline. The title indicates the topic. It starts with creation and ends with recreation. Everything is on a timeline, though the time of the final events is left open. 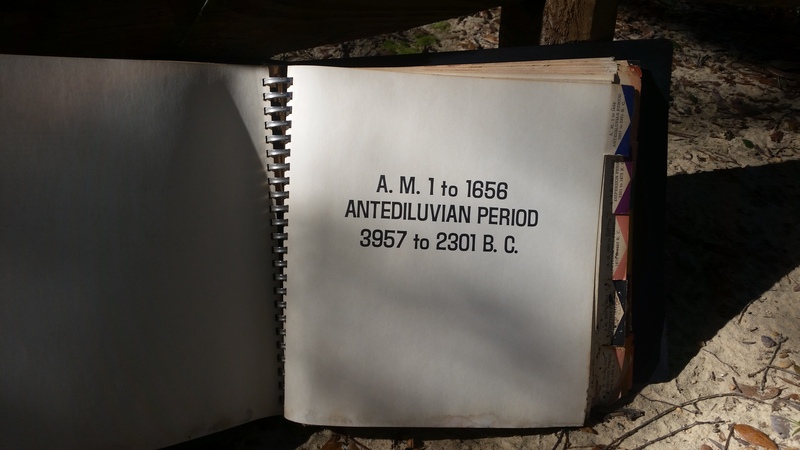 You can see the date of creation represented here and also the proposed date for the end of this period with the flood. This shows how the timeline spread out. I did this outside by the fence, so it’s a bit scraggly. In our classroom we had the whole thing stretched out around the wall. Click on it for high resolution.